I am so excited to be a part of this great group of SLPs! 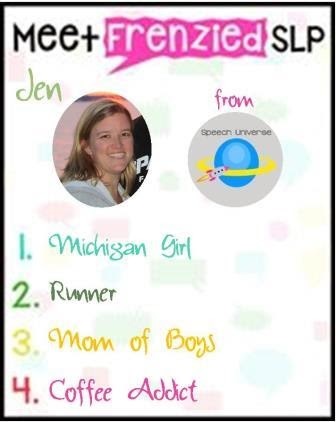 The Frenzied SLPs is a Facebook group designed to bring you tips and treats to help you get through your frenzied SLP life. Today, I am going to introduce myself and provide a quick tip. 1. A Michigan Girl: I was born and raised in Michigan. I left for a while to go to grad school, but returned to be close to my family. I love Michigan for the seasons, however, I have to admit to getting pretty sick of winter weather about now. We have an ice rink in our backyard this year that my husband built for the kids, so that has made this winter a little more tolerable. I absolutely love summer in Michigan though. 3. A Mom of Boys: I have two boys at home with me. They are super close in age (first and second grade), and really fun to hang with. They both play soccer, and because of the ice rink this year, they both really want to play hockey now too. They keep us pretty busy! 4. A Coffee Addict: I never thought that I would be such a coffee person. I started drinking it just a few years ago, and I have to admit, I am hooked. I bought an awesome cup from Teavana this year that keeps my coffee hot for a long time. I usually sip on a large cup in the morning, so it is nice that it stay hot for so long. I make my coffee at home, but as a treat, I do love Starbucks too. Well, that was a little bit about me. Now, for my tip this month. I'm sure a lot of you know how to do this, but I also know that some teachers that I work with did not know about this. It has to do with how you record your students. I used to have an ancient tape recorder that I had purchased when I was in undergrad from Radio Shack. I would have to guess where I had started recording my students and then rewind my tape again and again to get everything that I needed out of my recording. The iPad has changed the way that I record. I use an app called Quick Voice which is a free app offered on the iPad or iPhone. It is super easy to use, plus, I can label all of my recordings so that I know exactly where to go to listen to what I need. 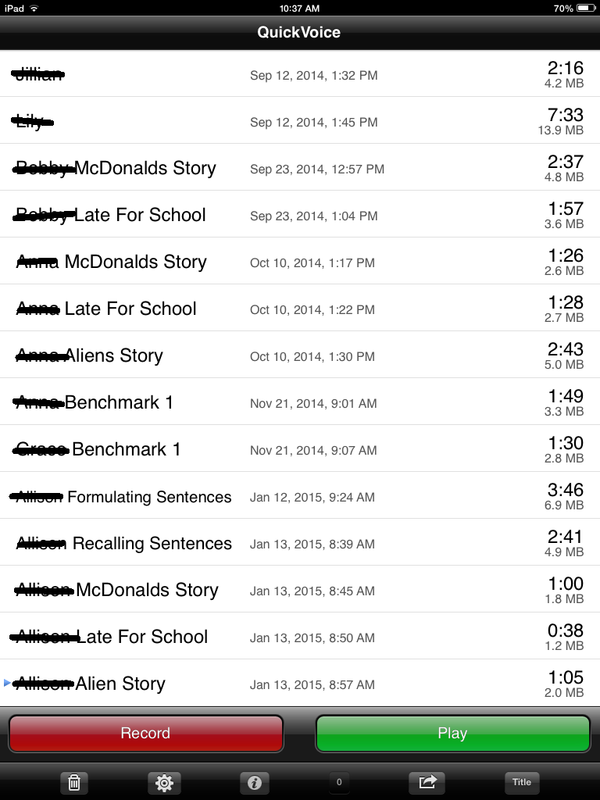 The app will save the title that I give the recording, as well as the date, time, and length of recording. Quick and easy! I also have another app called Recorder Pro. This app is sold for $1.99 at the app store. This app allows you to create folders and subfolders, make private folders that can be locked with a password, make ZIP of files so that you can email the recordings. I haven't used this one as much yet, but I love all of the capabilities in this one. I hope I am not the last person on the planet who found out about digital recording on your iPad, and hope this tip was useful to at least a few of you! GREAT idea! There are recording apps for Android devices also. I go back to the days of the cassette recorder and am SO GLAD to give it up! Super great tip and it was awesome learning more about you! Well, I still use a little voice recorder (no tape needed though). I never thought of an app for that! Thanks for the tip! I'm also a mom of boys (who are now men! )...I have 3! Enjoy this time with them...I loved that age; so much fun! I use Quick Voice all the time...it's so handy! I also use the camera on my ipad--just set it to video recording, point the camera down to a table, and go!